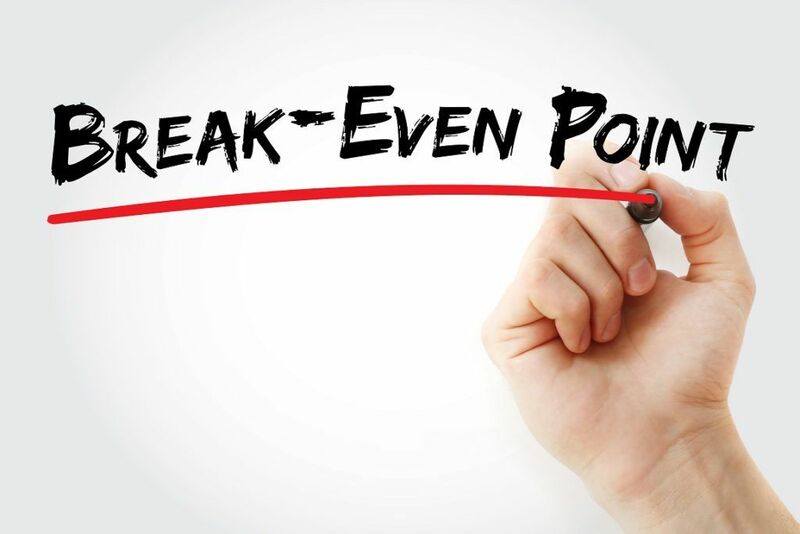 Break-even point (BEP) is a term in accounting that means a company’s revenues and expenses equaled within a specific accounting periodFiscal Year (FY)A fiscal year (FY) is a 12 month or 52 week period of time used by governments and businesses for accounting purposes to formulate annual financial reports. A Fiscal Year (FY) that does not necessarily follow the calendar year. It may be a period such as October 1, 2009 – September 30, 2010.. It means that zero or no profits at all were incurred by the company. The BEP may also refer to the revenues that are needed to be reached in order to compensate for the expenses incurred during a specific period. For example, Company ABC spent $100,000 on manufacturing costs and also acquired revenues worth $100,000. In such a case, the company only achieved its break-even point, which means it didn’t lose anything but it didn’t earn anything either. There are several differences between accounting break-even point and financial break-even point. Accounting break-even point, on the one hand, is the easiest and most common method of analyzing profits. It is easily calculated by taking the total expensesFixed and Variable CostsFixed and variable costs are important in management accounting and financial analysis. Fixed costs do not change with increases/decreases in units of production volume, while variable costs are solely dependent on the volume of units of production. This guide teaches an analyst the fixed vs variable cost methods on a particular production and computing how many units of the product need to be sold in order to cover the expenses. Financial break-even point, on the other hand, is more complicated to measure because it uses different measurements, even though it is the same concept. It doesn’t address a product or units but a company’s earnings, specifically about how much it needs to earn in order that its earnings per shareEarnings Per Share (EPS)Earnings per share (EPS) is a key metric used to determine the profit for the common shareholder's on a per share basis. Earnings per share measure each common share’s profit allocation in relation to the company’s total profit and can be calculated based on basic shares outstanding or fully diluted shares outstanding are equal to zero. Earnings mean the gross amount of money earned by the company before taxes and expenses are taken out. What is Contribution Margin in Relation to Break-even Point? The term contribution marginContribution MarginContribution margin is a business’ sales revenue less its variable costs. The resulting contribution margin can be used to cover its fixed costs (such as rent), and once those are covered, any excess is considered earnings. is often heard in relation to the break-even point. It refers to the actual profit a business can earn from every single unit sold. It is understood to be the product’s price, less the variable costs. Often, experts say the contribution margin shows the real profit and not the revenue. There are two ways to compute for the break-even point – one is based on units and the other is based in dollars. When there is an increase in customer sales, it means that there is higher demand. And when it does, a company needs to produce more of its products to meet this new demand which, in turn, raises the BEP in order to cover the extra expenses. The hard part of running a business is when customer sales or product demand remains the same while the price of variable costs increases, such as the price of raw materials. When that happens, the BEP also goes up because of the additional expense. Aside from production costs, other variable costs that increase include rent of warehouse, increase in salaries for employees, or higher utility rates. In cases where the production line falters, or a part of the assembly line breaks down, the BEP increases since the target number of units is not met within the required time. In order for a business to generate higher profits, the break-even point must be lowered. Here are the most effective ways of reducing the break-even point. This is something that not all business owners want to do without hesitation, thinking that it will make them lose some customers. Profitability may be increased when a business opts for outsourcing, which can help reduce manufacturing costs when production volume increases. Thank you for reading CFI’s explanation of break-even point. CFI is the official provider of the Financial Modeling and Valuation Analyst (FMVA)™FMVA™ CertificationThe Financial Modeling & Valueation Analyst (FMVA)™ accreditation is a global standard for financial analysts that covers finance, accounting, financial modeling, valuation, budgeting, forecasting, presentations, and strategy. certification program, designed to transform anyone into a world-class financial analyst.